Jeff Jacoby: Is this any way to help the poor? Is this any way to help the poor? Welfare payments issued to recipients long after they were listed as dead. Multiple recipients using one Social Security number - and multiple Social Security numbers being used by one person. Electronic benefit cards from Massachusetts being used in places like Hawaii, Las Vegas, and the Virgin Islands. Tens of thousands of blank EBT cards missing from state welfare offices. Repeated requests for "lost" benefit cards to be replaced. In a report that covered only a two-year period, Bump's investigators identified at least $18 million in illegal or suspicious welfare payments. "It pains all of us," Bump told reporters, "to think that the program's integrity is not being maintained." If this sounds familiar, it should. Blistering expos�s of welfare fraud and abuse, in Massachusetts and elsewhere, have become almost routine. Over a 22-month period in New Jersey, that state's comptroller disclosed last week, prison inmates collected almost $24 million in unlawful welfare benefits - including $10.6 million in unemployment checks and $4.2 million in food stamps. TV reporters in Florida documented the use of welfare benefit cards in strip clubs, liquor stores, bowling alleys, and bingo parlors. A 65-year-old cashier in New Hampshire was fired last year for refusing to let a young man use an EBT card to buy cigarettes. The new Massachusetts audit, meanwhile, followed an earlier report by the state's inspector general, who estimated that the state is squandering $25 million a year on improper welfare payments. And before that was a national investigation by the US Department of Agriculture, which administers the food stamp program. It uncovered fraud in every state it reviewed. Is welfare corrupt? Is it ever. And yet the infuriating waste of taxpayer funds is only the beginning of the corruption. More Americans rely on government assistance today than ever before. Food stamps have become almost a middle-class entitlement. At the end of 2012, a record 47.8 million people were on food stamps. Of the 115 million households in the United States, 23 million - one in five - are on the food dole. It wasn't so long ago that such a degree of dependency would have been inconceivable. In 2001, according to federal data, 17.3 million people were receiving food aid. In little more than a decade, the food stamp rolls have almost tripled. That didn't happen by accident. Under the last two presidents, increasing food stamp enrollment became an explicit government goal. George W. Bush sharply expanded eligibility, rebranding food stamps as "nutritional assistance" instead of welfare. States were encouraged to sign up more recipients - a ball the Obama administration took and ran with. The Agriculture Department promotes food stamps through radio ads and "public service" announcements; billboard-style ads appear on city buses. To attract even more participants, USDA advises local welfare agencies to "host social events where people mix and mingle" - show them a good time, and try to get them on welfare. 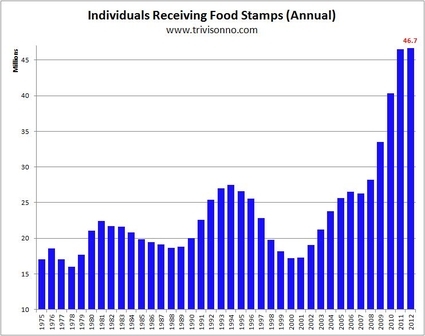 Both the Bush and Obama administrations set out to expand the number of people on food stamps - with dramatic results. Is this any way to help the poor? FDR didn't think so. In his annual message to Congress in 1935, President Roosevelt warned that "continued dependence upon relief induces a spiritual disintegration fundamentally destructive to the national fiber." The father of the New Deal knew that "to dole out relief in this way is to administer a narcotic, a subtle destroyer of the human spirit. It is inimical to the dictates of a sound policy. It is in violation of the traditions of America." It is a mark of how far we have declined that a political figure who dared to say such a thing today would be denounced as heartless, a hater of the poor, even a racist - as Newt Gingrich found out when he tried to make an issue of soaring food stamp rates during the presidential campaign. When Massachusetts lawmakers last year tried to prevent EBT cards from being used to pay for tattoos, guns, or jewelry, Governor Deval Patrick vetoed the measure, saying he would not be a part of "humiliating poor people" or making them "beg for their benefits." FDR feared the effect of long-term dependence on government. Political leaders today enable it. Welfare corrupts in so many ways. What it does to taxpayers is bad, and what it does to welfare recipients is worse. But what it is doing to our nation's character and deepest values may be its most damaging impact of all.